For other uses, see Bernicia (disambiguation). Bernicia (Old English: Bernice, Bryneich, Beornice; Latin: Bernicia) was an Anglo-Saxon kingdom established by Anglian settlers of the 6th century in what is now southeastern Scotland and North East England. The Anglian territory of Bernicia was approximately equivalent to the modern English counties of Northumberland and Durham, and the Scottish counties of Berwickshire and East Lothian, stretching from the Forth to the Tees. 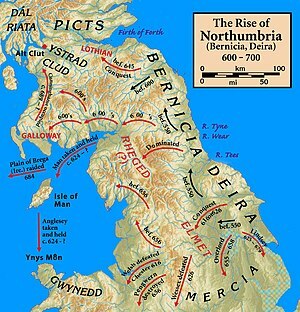 In the early 7th century, it merged with its southern neighbour, Deira, to form the kingdom of Northumbria and its borders subsequently expanded considerably. Bernicia occurs in Old Welsh poetry as Bryneich or Brynaich and in the 9th-century Historia Brittonum, (§ 61) as Berneich or Birneich. This was most likely the name of the native Brittonic kingdom, whose name was then adopted by the Anglian settlers who rendered it in Old English as Bernice or Beornice. The counter hypothesis suggesting these names represent a Brythonic adaption of an earlier English form is considered less probable. Local linguistic evidence suggests continued political activity in the area before the arrival of the Angles. Important Anglian centres in Bernicia bear names of British origin, or are known by British names elsewhere: Bamburgh is called Din Guaire in the Historia Brittonum; Dunbar (where Saint Wilfrid was once imprisoned) represents Dinbaer; and the name of Coldingham is given by Bede as Coludi urbs ("town of Colud"), where Colud seems to represent the British form, possibly for the hill-fort of St Abb's Head. The Brythonic kingdom of the area was formed from what had once been the southern lands of the Votadini, possibly as part of the division of a supposed 'great northern realm' of Coel Hen in c. AD 420. 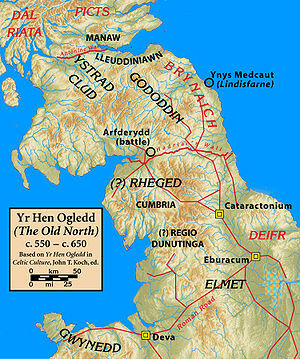 This northern realm is referred to by Welsh scholars as Yr Hen Ogledd or, literally, "The Old North". The kingdom may have been ruled from the site that later became the English Bamburgh, which certainly features in Welsh sources as Din Guardi. Near this high-status residence lay the island of Lindisfarne (formerly known, in Welsh, as Ynys Metcaut), which became the seat of the Bernician bishops. It is unknown when the Angles finally conquered the whole region, but around 604 is likely. There are several Old Welsh pedigrees of princely "Men of the North" (Gwŷr y Gogledd) that may represent the kings of the British kingdom in the area, which may have been called Bryneich. John Morris surmised that the line of a certain Morcant Bulc referred to these monarchs, chiefly because he identified this man as the murderer of Urien Rheged who was, at the time, besieging Lindisfarne. Some of the Angles of Bernicia (Old English: Beornice) may have been employed as mercenaries along Hadrian's Wall during the late Roman period. Others are thought to have migrated north (by sea) from Deira (Old English: Derenrice or Dere) in the early 6th century. The first Anglian king in the historical record is Ida, who is said to have obtained the throne and the kingdom about 547. His sons spent many years fighting a united force from the surrounding Brythonic kingdoms until their alliance collapsed into civil war. Ida's grandson, Æthelfrith (Æðelfriþ), united Deira with his own kingdom by force around the year 604. He ruled the two kingdoms (united as Northumbria) until he was defeated and killed by Rædwald of East Anglia (who had given refuge to Edwin, son of Ælle, king of Deira) around the year 616. Edwin then became king. The early part of Edwin's reign was possibly spent finishing off the remaining resistance coming from the Brythonic exiles of the old British kingdom, operating out of Gododdin. After he had defeated the remaining Brythonic population of the area, he was then drawn towards a similar subjugation of Elmet (a Cumbric speaking territory that once existed in the modern-day West Riding of Yorkshire, near Leeds), which drew him into direct conflict with Wales proper. Following the disastrous Battle of Hatfield Chase on 12 October 633, in which Edwin was defeated and killed by Cadwallon ap Cadfan of Gwynedd and Penda of Mercia, Northumbria was divided back into Bernicia and Deira. Bernicia was then briefly ruled by Eanfrith, son of Æthelfrith, but after about a year he went to Cadwallon to sue for peace and was killed. Eanfrith's brother Oswald then raised an army and finally defeated Cadwallon at the Battle of Heavenfield in 634. ^ Note 566 in John T. Koch, ed. (1997). The Gododdin of Aneirin: text and context from Dark-Age North Britain. University of Wales Press. p. 216. ISBN 978-0-7083-1374-9. Retrieved 18 October 2011.